DataCore SANsymphony ensures high-priority workloads competing for access to storage can meet their service level agreements (SLAs) with predictable I/O performance. 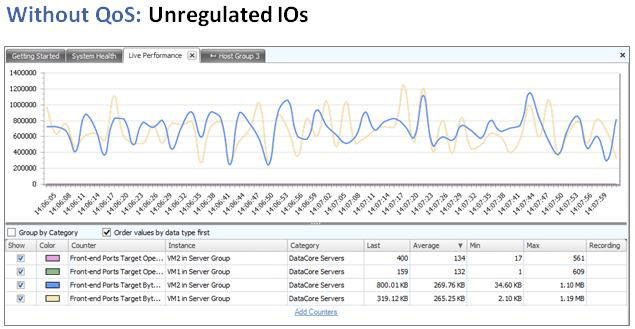 QoS Controls regulate the resources consumed by workloads of lower priority. Without QoS Controls, I/O traffic generated by less important applications could monopolize I/O ports and bandwidth, adversely affecting the response and throughput experienced by more critical applications. To minimize contention in multi-tenant environments, the data transfer rate and IOPS for less important applications are capped to limits set by the system administrator. QoS Controls enable IT organizations to efficiently manage their shared storage infrastructure using a private cloud model. Storage resources can be logically segregated, tracked and regulated on a departmental basis as illustrated below. QoS parameters can be set for individual hosts or groups of hosts as well as for groups of virtual disks for fine grain control. For streaming applications which burst data, it’s best to regulate the data transfer rate (MB/sec) to minimize their impact. 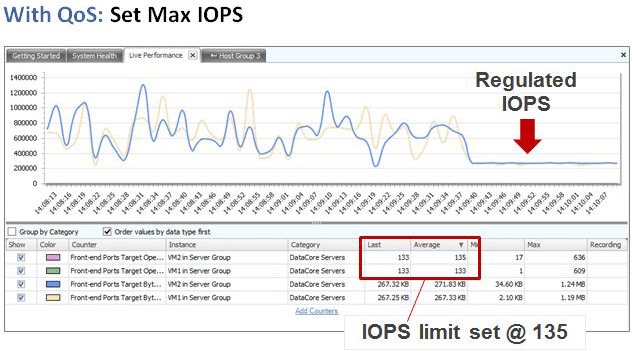 For transaction-oriented applications (OLTP), limiting the IOPS makes most sense. Both parameters may be used simultaneously. The effects are illustrated below. First, the behavior of competing workloads is shown in an unregulated environment. Next, the effects of limiting IOPS are highlighted. Talk with a storage expert to learn how DataCore can help you meet service level agreements (SLAs) with predictable I/O performance.